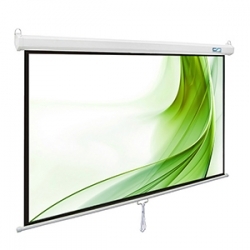 Intelligent Electric Screen 120" Diag. Adopt Aluminum Case and Equipped with Silent Tubular Motor. High Quality Import Soft Fabrics, 4K Ultra HD and Active 3D Projection Ready. Multi-layer PVC Material, Flat Tensioned, Lightly textured screen with 160 degree viewing angle. Standard black border on 4 sides, effectively absorb radiation light. Adopt the unique pyramid bottom bar, ensure the surfce flatness. The Screen Surface Utilizes Unique Materials Creating a Smooth Surface for Superior Image Quality. Standard Wall Switch, RS485 serial port, Infrared (IR) and Radio Frequency (RF) Remotes, 12V Trigger Port is Optional. Features an Arcuate Profile Casing that easily installs to your wall / ceiling with the included mounting kit. Accept any custom size and back drop size, the biggest size is 150-Inch diagonal for the aluminum casing. Control it with the included wall switch and remote control. features a white / black enameled, aluminum casing with arcuate profile. 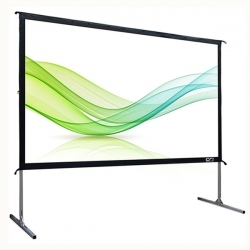 Intelligent Electric Projector Screen can do tab-tension or non tab tension type. Wide viewing angle screen material with textured, Mildew resistant and easy to clean with mild soap and water. Screen can be conveniently operated with the infrared remote, radio frequency remote, detachable 3-way wall switch, or synch to projectors power cycle with the included wireless trigger. Dual mounting options allow the screen to be secured to a wall or a ceiling. Ships fully assembled, plug and play ready. The Ultra high contrast screen finish provides the ultimate multimedia experience by enhancing the color and contrast performance of your projected image or video content.